Cycling in Nigeria was always lively. Africa’s most populous country also has some of the cheapest fuel costs. These two things combined means there are a lot of vehicles on the road. And, like most of Africa, there are few rules. I rarely took photos in busy urban environments when alone. There was often too much happening around me and I needed to focus my attention on what was coming up ahead. 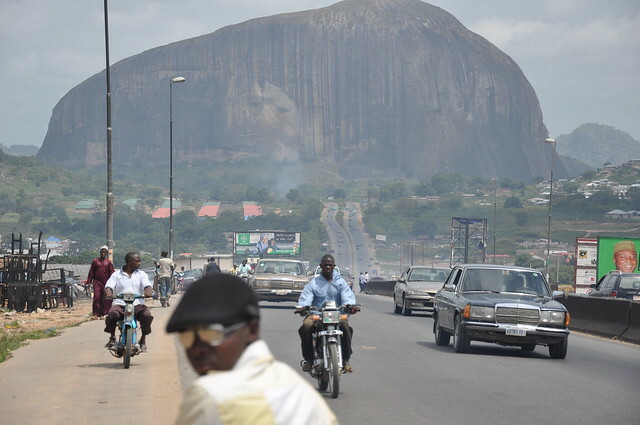 This enormous monolith, Zuma Rock, is often dubbed the gateway to Abuja, Nigeria’s modern capital. With such an imposing backdrop to the road I decided to make a quick photo stop before continuing, nearly getting run-over by this guy in sunglasses who was coming the opposite way on a motorbike. I made it to Abuja later that day, which is one of the most developed African capitals I spent time in. My blog post from the time I spent there can be read here.